I received my first digital camera in the early 2000’s as a birthday present (though I had used my parents’ Sony Mavica and a few floppy disks for years prior) and I’ve done what I can to save every picture and video taken with that camera and every digital camera I’ve had – including phones – ever since. I’m not a photographer by any means – not even a hobbyist – but I, like anyone else, takes pictures during any kind of event that’s going on. And since becoming a dad, I’m taking pictures nearly every day since, you know, kids do something new all the time ;). Anyway, this means that I have a little over 10 years worth of pictures and videos archived. I’m compulsive about their organization (and I’m also a little paranoid about losing them which has lead to a multisite backup strategy, but that’s for another post). That is, I organize all of the photos by year, month, day, hour, minute, and second – or I try to do so up to whatever the greatest level of detail is. 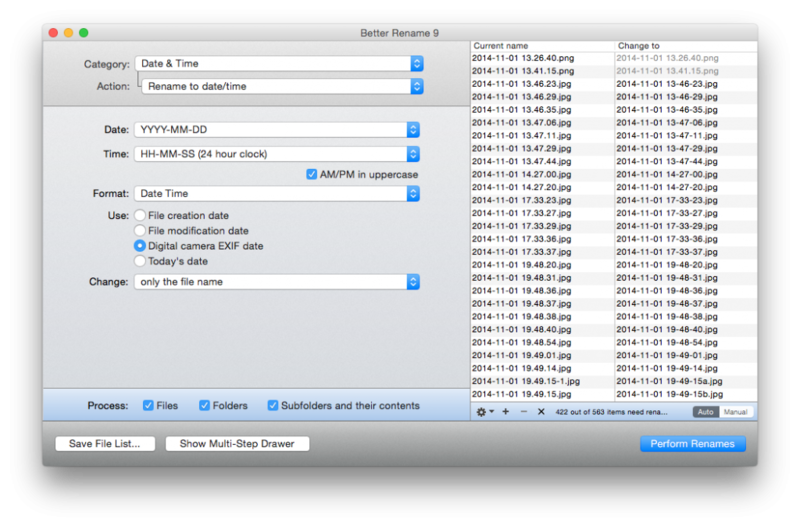 Since phones and digital cameras keep so much information in their EXIF data, this is relatively easy to do. But cameras haven’t always kept so much information in their EXIF data. Although they haven’t kept as much rich information such as photo location, most digital cameras have at least been able to stamp photos with a time stamp in some area of the photo’s data. And that is what can be used to help properly rename a file. Of course, it’s not always easy and/or efficient to look at the information for each photo and then manually rename the file. That’s where Better Rename 9 comes into the, ahem, picture. For the majority of the work that I use with this application, I’m renaming photos, so I typically select Date and Time and then use the YYYY-MM-DD HH-MM-SS (24 hour clock) format to name them as such. After setting those options, I drop an entire directly into the right-side area of the app’s window after which it processes the files to show you how it will be named once the process is complete. After that, I kick off the process and let the app do it’s thing. It’s that simple and it’s worked for the majority of the 10+ years worth of photos and videos I’ve had. As far as keeping media files organized, I’ve found no better tool. The only time I’ve ever had Better Rename 9 not work properly when renaming files is when it was dealing with pictures I had taken back in the year 2000 to 2001 or a little earlier. Generally speaking, this has to do with how the EXIF data was stored in the file – Better Rename 9 wasn’t able to locate it. To that end, I was able to manually rename the file using ExifTool. It’s a powerful alternative with a steep learning curve and far less attractive UI, but if you find yourself dealing with older photos, then it’s worth a try. Other than that, I’ve never had a problem with Better Rename 9 and I’ve been using it for several months now. Highly recommended.